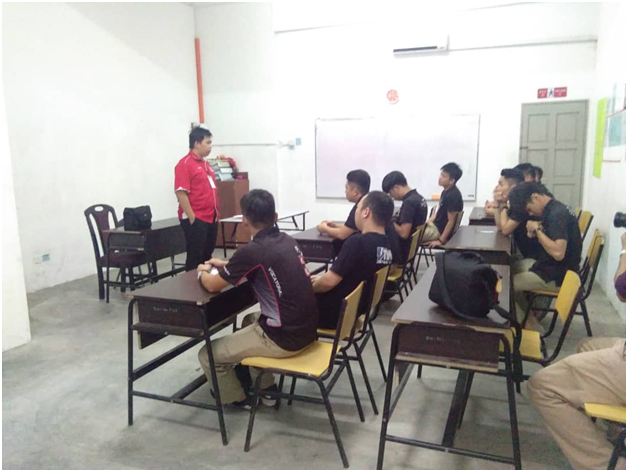 As per the request from the Group CEO, Kolej AITC Kuching has organized an Automotive Short Course – Turbocharger System for students from Chung Hua Middle School No. 3. Overall, there were nine students of age 17 to 18 years old who attended this course. The training was conducted on three consecutive days, starting from 27th to 29th of August 2018 at Automotive Department. Each day the session would start at 8.30 am and end at 4.30 pm. There was an hour lunch break at 12.00 noon daily. The main objective behind the short course is to attract students’ interest in taking diploma program offered by I-Systems College, such as Diploma in Automotive Technology or any other programs in the near future. 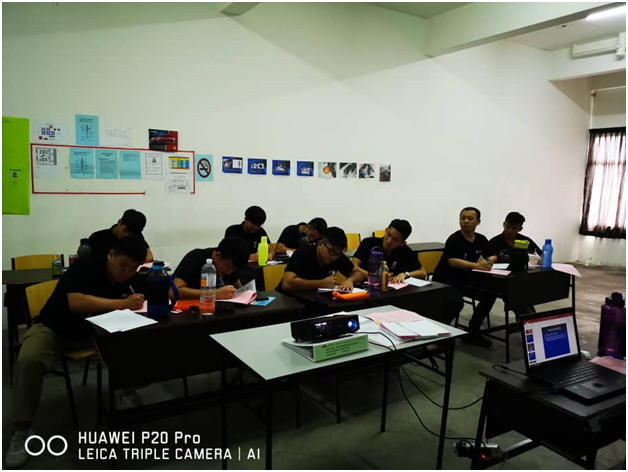 The course is led by two Chinese speaking trainer; Kelvin Lee and Dominic Hardin who are skilled in preparing the students for their dream careers in automotive industry. The training session started with a short speech given by Madam Dayang Fashitah to welcome all the students who attended the course. She also introduced the trainers to the students. There was a briefing by Kelvin Lee about the basic guidelines to be applicable during the training days in order to maintain a productive and organized training program. The students agreed upon the guidelines for the training like putting their phones on silent mode, coming on time, no smoking, respecting other’s ideas, not interfering other students, etc. Then they were brought to tour around the campus before the training began. Lunch break for the students was from 12.00 noon to 1.00 pm. Lunch meal was provided to them during that three-day course. The theory session would continue after the lunch break and different methods were used by the trainer for delivering the contents. Before ending the day’s session, the trainer would recap the topics discussed during the day with input from the students. This was done by asking the students about what they had learnt and what were the main points discussed. On the second day of the training, students were brought to the workshop for hands-on technical session led by Dominic Hardin. They were taught about the components and functionality of turbocharger and were exposed on how to perform correct maintenance procedures. At the end of the course, there was an assessment conducted by the trainer which was aimed at gauging the knowledge and understanding of the students about the topics discussed during the training. 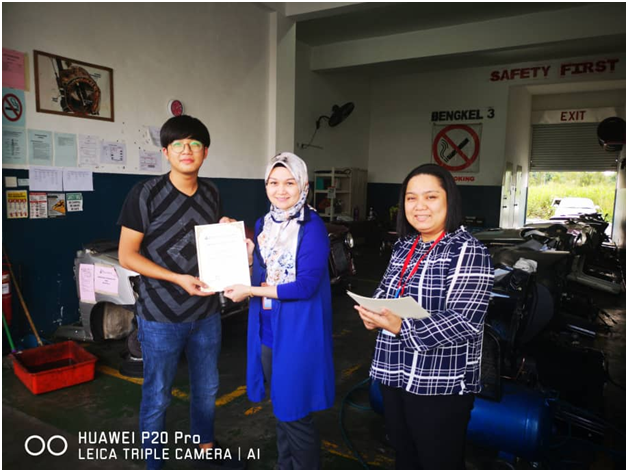 The Certificate of Participation was presented by Madam Dayang Fashitah to the students on the last day of the course. 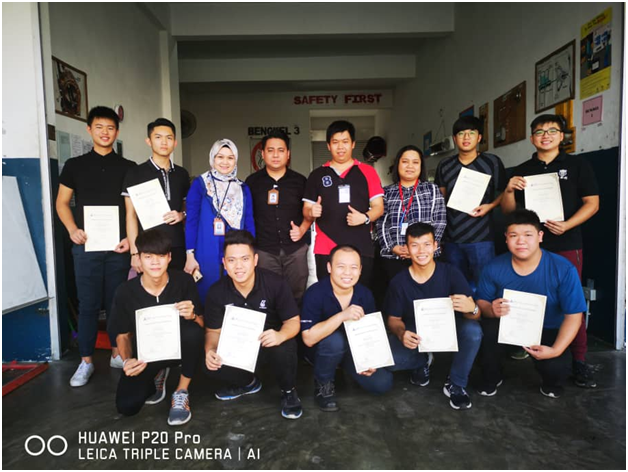 The training program was conducted successfully and all students that attended the training took active part in all the three days of the training. The students look forward for their 2ndshort course which will be held on the 3rd of September 2018.